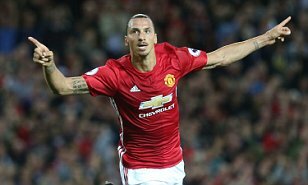 Zlatan Ibrahimovic came to the premier League on free transfer from Paris Saint Germain (France) to Manchester United before the start of the season and has since Scored 18 goals in all competitions, 13 in the Premier League, trailing with one less than the top scorer Diego Costa (Chelsea). Ibrahimovic spoke to the clubs website - he had conquered England in just three months of his presence and right now does not have any individual targets, as he has accomplished all. "I'm chasing the head trophy -- the Premier League. That is my aim. "The individual things come as part of the main objective because that is like a bonus for every individual player. If the collective does well, then the individuals will do well. "I try to help the team and try to do what I'm best at -- scoring goals, playing good and creating chances for my team-mates. As long as I can do that, I know I will help my team. "The same thing with them, they help me the way they can for the team. I have no individual targets because that I did already, after three months in England. I conquered England -- it took three months. Zlatan Ibrahimovic who is now fit for return in the clash against Liverpool in the weekend said United is finding it's feet and could still challenge for the premier League title despite trailing Chelsea with 10 points in sixth position. "The last one-and-a-half months have shown the right way. The gap has been bigger but now it's better, so we are closer to that now. "We wait for the other teams to have their dips, to make their mistakes, and we will be there."